German Chancellor Angela Merkel and Prime Minister Narendra Modi held talks on stepping up bilateral cooperation in a range of key areas with a special emphasis on ramping up trade and investment when global slowdown is emerging as a major concern. Merkel, accompanied by a large delegation of cabinet ministers and top officials, arrived here last night and was accorded a ceremonial welcome at the Rashtrapati Bhavan on Monday morning. Ways to deepen bilateral engagement in diverse sectors like defence, security, education and renewable energy figured in the summit-level inter-governmental consultations between Modi and Merkel which also deliberated on issues relating to trade and investment. "The real business of diplomacy. The 3rd India-Germany Inter Governmental Consultations begin, led by PM & Chancellor," tweeted External Affairs Ministry Spokesperson Vikas Swarup. India and Germany are strategic partners since 2001. 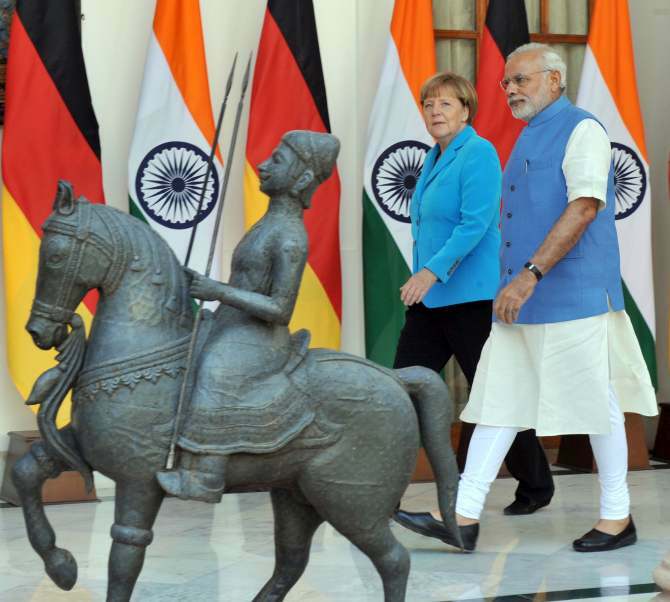 The German Chancellor's visit comes around six months after Modi's tour to Germany in April. Germany is India's largest trading partner in European Union and the seventh largest foreign investor in India. The overall exchange of goods and services between the two countries was valued at around 15.96 billion Euros last year, a drop of 1.14 billion Euros from the level of 16.10 billion Euros registered in 2013. While India's exports to Germany rose marginally to 7.03 billion Euros in 2014, its German imports dropped to 8.92 billion Euros from 9.19 Euros in the previous year. More than 1,600 Indo-German collaborations and around 600 Indo-German joint ventures are currently in operation. Ahead of Merkel's visit, German Ambassador Martin Ney said the third inter-governmental consultations are expected to come out with "path-breaking results" and inking of "substantial" number of agreements between the two countries. External Affairs Minister Sushma Swaraj called on Merkel ahead of her talks with Modi. Is frequent flyer Modi overdoing it?